alan131210 wrote: i dont think they show that map forcing it on us, its just a map they prob found on google. Yea but it's one hell of a terrible map. [quote="alan131210"]Washington reveals new map of the world, including "Greater Kurdistan"
Do they actually mean greater Kurdistan or just south Kurdistan? Well they speak of SK but WK is also free and sooner or later EK will be too leaving us with one part the hardest part NK. NEWSDESK, -- A group of Kurdish academics, artists, journalists and civil activists have declared in a statement that they demand a referendum to be implemented in East Kurdistan to decide the future administration of Kurdish people in this part of Kurdistan. In response to the antagonistic statement of the Iranian opposition group against the agreement reached by two Kurdish political parties to launch a unified front, a number of Kurdish academics, journalists and activists demand a referendum to be conducted in East Kurdistan on self-determination of the Kurds. For the last few days since the signing of an agreement between the two Kurdish political parties of East Kurdistan (Democrat Party of Iranian Kurdistan and the Iranian Kurdistan Komele) the Iranian chauvinism has once again pointed its focal attacks on Kurdistan. Although this agreement embodies a tiny amount of the legitimate national demands of the Kurdish nation, nevertheless it has been the subject of attacks by the Iranian authoritarian opposition. This fact exhibits the concord between this pretentious opposition and the Islamic Republic of Iran in the suppression of the legitimate rights of the Kurdish nation. Such a scale of hostility toward an agreement which represents a minimal level of aspiration of the Kurdish nation, displays fears of the Iranian authoritarian opposition from the unity and coherence of Kurdish political parties and circles. Hereby we the signatories of this declaration urge all Kurdistan’s parties to launch wider and stronger fronts while we are manifesting our backings for any kinds of unity and cooperation among the political parties of East Kurdistan in the struggle to realise the legitimate rights of Kurdish nation. The antagonistic positioning of pan-Iranist spanning the rights, the lefts and communists as well as the Islamists to the [aforementioned] agreement demonstrates that hostility toward the Kurdish nation and the suppression of liberation movements of this resilient people comes at the top of these circles’ agendas. When it comes to the rights of the Kurdish nation, they would all set aside their previous disagreements and the suppression of the legitimate struggles of Kurdish nation becomes their joint and sanctified goal—whose pretext is the preservation of Iranian territorial integrity. Therefore we have reached a conclusion that maintenance of life within the framework of Iranian borders has become impossible for the Kurdish nation, owing to the fact that the Kurdish nation has been subjected to threats from both the Islamic Republic of Iran as well as its opposition. This would mean that after the downfall of the Islamic Republic of Iran, a new cycle of suppression of the Kurdish nation by the current opposition—the Iran’s potential rulers— would break out. Consequently, we the signatories of this declaration stress on the rights of the Kurds to self-determination and of the Kurds’ power to determine their destiny. To avoid the repetition of catastrophes that have plagued Kurdistan for the last eighty years, we call for a referendum to be implemented in Kurdistan under the supervision of the international institutions and the humanitarian foundations, in order to decide Kurdistan’s future political administration. Why is it every single Kurdistan map exclude Ilam? I'm so confused by this. Even in some maps Kirmanshan is excluded or just about put in. Well, this Kurdistan map is too small. alan131210 wrote: Well they speak of SK but WK is also free and sooner or later EK will be too leaving us with one part the hardest part NK. How do you think northern Kurdistan will be liberated? I would guess in a massive kurdish revolution. once a brave US leader comes to power that hates turks and kicked them out of NATO , or when America's interest in the ME changes i.e. Russia is weaker than now etc... then US will no longer need puppet turkey and abandon them to the kurds to take care of, and we will make sure we will do a good job. You dont must like them, but it is better for Kurdistan to have USA as a Partner. At the moment the USA is the best partner. I know they have backstabed us but everyone has done it and we can still have good relation with neigbourring ountries. USA does'nt support an independent northern Kurdistan, and they won't get my support, before they grow some nuts and stop obeying Turkeys every command. STRASBURG, France, — Eurominority or what is known as the Stateless Nations and Minority Peoples in Europe has just published the new map of Kurdistan as displayed. Eurominority and the Kurdish Institute of Paris (Institut kurde de Paris) released a new map of Kurdistan with the purpose of acknowledgment of the “Nation of Mount Ararat”, the report said. 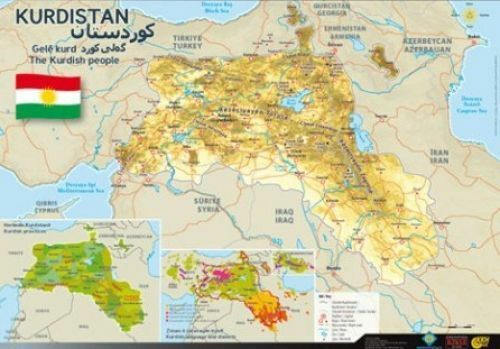 Published in Kurdish and English, the map shows the main Kurdish cities, mountains, rivers as well as the lakes that form the historical and grand Kurdistan. Two additional maps also give a good point of view of the Kurdish provinces distributed Among the Turkish, Syrian, Iranian and Iraqi States. The poster also presents a simplified map of dialects of the Kurdish language, thus making the work one of the most synthetic maps of historical Kurdistan. The map involves the provinces of Maraş, Elbistan, Koçgiri, Erzincan, Erzurum, Kars, Igdir, Agrı, Maku, Urmiye, Mahabad, Bicar, Kirmaşan, Ilam, Xaneqin, Kerkuk, Musul, Qamişlo and Afrin. Eurominority was founded by Mikael Bodlore-Penlaez for the promotion of the Stateless Nations and national minorities of Europe in 1999. The establishment aims to publish researches and information obtained through an expansive network of correspondents across Europe. The website provides online service in 30 languages. Last edited by alan131210 on Sun Sep 30, 2012 11:24 am, edited 1 time in total.